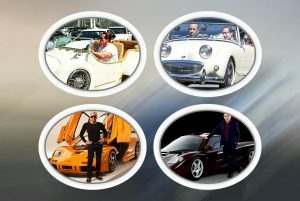 Celebrity cars collections is a topic that people read more interesting as they get to k now about the life and cars collection of their favorite celebrities. 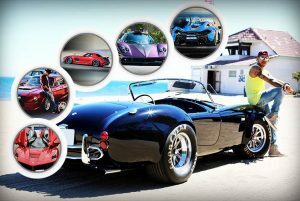 Many famous celebrities are the owner of a various luxury, sports, and classic cars that make their garage looks appealing. Most of the celebrities are the brand ambassadors of many renowned vehicle companies. If we talk about the celebrity cars collection than how can we forget the name of one of the most famous wrestler Dwayne Johnson? This wrestler gets a huge fame because of its famous wrestling and he is most commonly famed as “The Rock”. There are various luxurious vehicles that are owned by The Rock and few of them are discussed below. 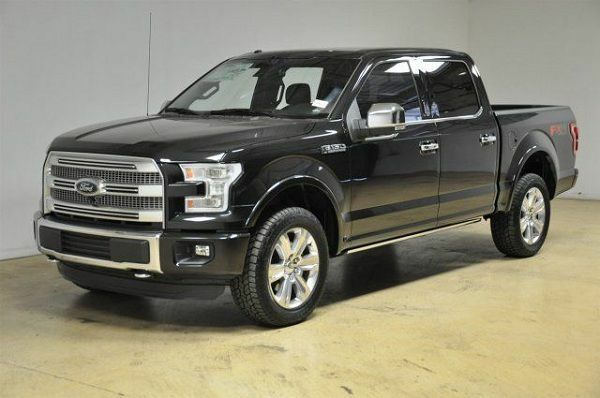 The collection of celebrity luxury cars also include a name of F 150 by Ford, this is a pickup truck and this vehicle shares a garage of Dwayne Johnson “The Rock” with other astonishing luxury vehicles. Ford makes this vehicle F 150 a custom built vehicle for the Dwayne Johnson to fit in as he cannot easily fit in the all vehicles. The Rock is also a brand ambassador of Ford Company in the USA and in 2015, he signed a deal for many years with the company for a campaign named as “The Specialists at Ford”. Through this campaign, The Rock joined a team of technicians to aware the people about the services offered by “Blue Oval”. The vehicle of The Rock customized Ford F 150 is not available in the market as he modified his vehicle from California Custom Sports Trucks so, that he can easily fit in and can drive around the city easily. This custom built pickup truck gets all black treatment and a lift kit, especially for Dwayne Johnson. Dwayne Johnson named his pickup truck as “The Bull” by saying that it is the vehicle that he can easily fit in and it is equipped with 5-inch Dual Exhaust System. This pickup truck is also fitted with tinted windows, custom aggressive hood, Upgraded Sound System and a custom black matte grille. The design of this celebrity pickup truck is amazing, the structure of this vehicle is made of aluminum alloy and steel frame that lights the weight of the vehicle up to 700 pounds. This vehicle has an eye catching design, it has sleek lines with smooth curves that make this vehicle stands out among all other vehicles and after all, it is a vehicle of one of the most famous wrestlers “The Rock”. It is a celebrity car and how it is possible that the interior of this vehicle can be normal? No, not at all. Ford company used outclass and luxurious material in the vehicle that mesmerizes people. The seats are nicely wrapped with leather to give a comfortable journey to its riders. The color combination of the whole cabin is amazing. This pickup truck is also fitted with advanced safety and technological features. This vehicle is fitted with a powerful engine that boosts the performance of the vehicle and gives a strong grip on the road. This vehicle is equipped with 3.5-Litre EcoBoost 6 Cylinder Engine that produces 282hp and 253Nm of torque. The estimated fuel efficiency of this vehicle is 18mpg in the city, 24mpg on the highway and its combined estimated fuel efficiency is 20mpg. It has 10-Speed Transmission. Celebrities and their cars list are full of a fabulous vehicle and Ferrari LaFerrari is one of them. This vehicle is also owned by Dwayne Johnson “The Rock”. Dwayne Johnson received this vehicle as a complementary lease. 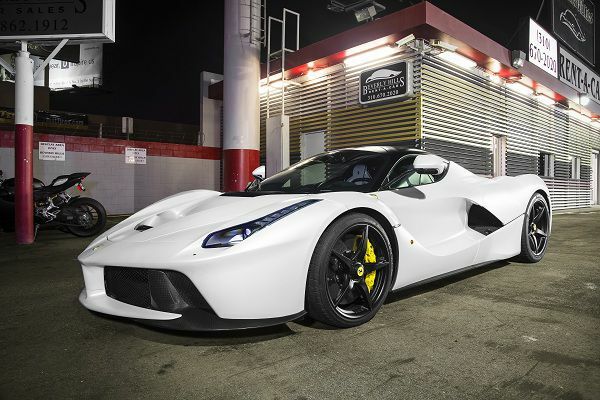 This vehicle was made by Ferrari and only limited number of vehicles were produced by Ferrari of LaFerrari. Ferrari gifted this vehicle to The Rock, but unfortunately, Ferrari did not think about this famous wrestler once because a 6”5’ body cannot fit in LaFerrari. The design of this celebrity vehicle is amazing, it has a fabulous design with sleek lines and smooth curves that appeal people to give it a second look. The structure of the vehicle is body colored with a black roof. The unique design lights are fitted in the vehicle that gives an aggressive yet a catchy look to the vehicle. It is fitted with LED headlights and brake lights. The interior of this vehicle can simply mesmerize anyone as the Ferrari used the finest material in the vehicle. The seats are wrapped with leather and on the other hand, the steering wheel and the dashboard nicely complement the whole cabin. This vehicle is fitted with the latest safety and technological features. This vehicle is equipped powerful motor that enhances the performance of the vehicle. It is fitted with 6.3-Litre 12 Cylinder Engine that produces 950bhp and 663Nm of torque. It accelerates 0-100 Km/h in 3 seconds and the top speed of this vehicle 350 Km/h. This vehicle has 7-Speed DCT transmission. Rolls-Royce Wraith is one of the best celebrity luxury cars and this vehicle is also a part of the Dwayne Jonson’s garage. It is a 2 door coupe and you can often see one of the super famous wrestlers The Rock in this vehicle. The design of this vehicle is impressive as it is one of the luxurious brand’s vehicle, so it is obvious that the design should be up to the mark. This luxurious vehicle has a dynamic design with style and lines that make this vehicle stands out among all other luxurious vehicles. This vehicle is equipped with a unique design of lights that nicely played the role to enhance the beauty of the vehicle. 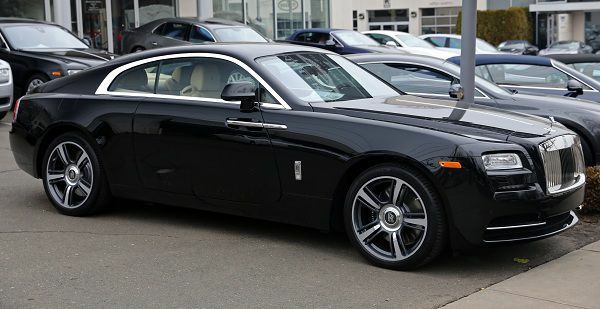 Rolls-Royce fitted Wraith with programmable projector beam, high intensity low and high beam, daytime running lights and auto-leveling directionally adaptive headlamps with washer delay off. Approach lights and LED brake lights are also the part of this vehicle. The interior of this amazing vehicle is s imply an eye-catcher as it is equipped with outclass luxurious material. The seats of this vehicle are wrapped with the finest leather and the seats are equipped with hand stitched monogram that gives a traditional Rolls-Royce look to the vehicle. This celebrity vehicle is considered to be one of the most famous vehicles and Rolls-Royce fitted this vehicle with advanced safety and technological features. This celebrity vehicle is equipped with a powerful engine that boosts the performance of the vehicle. It is fitted with 6.6-Litre twin-turbocharged 12 Cylinder Engine that is able to produce 624hhp and 605Nm of torque. It has 8-Speed automatic transmission. The estimated fuel efficiency of this vehicle is 12mpg in the city and 19mpg on the highway. Its combined estimated fuel efficiency is 15mpg. The fuel tank capacity of this vehicle is approximately 21.9 gallon. 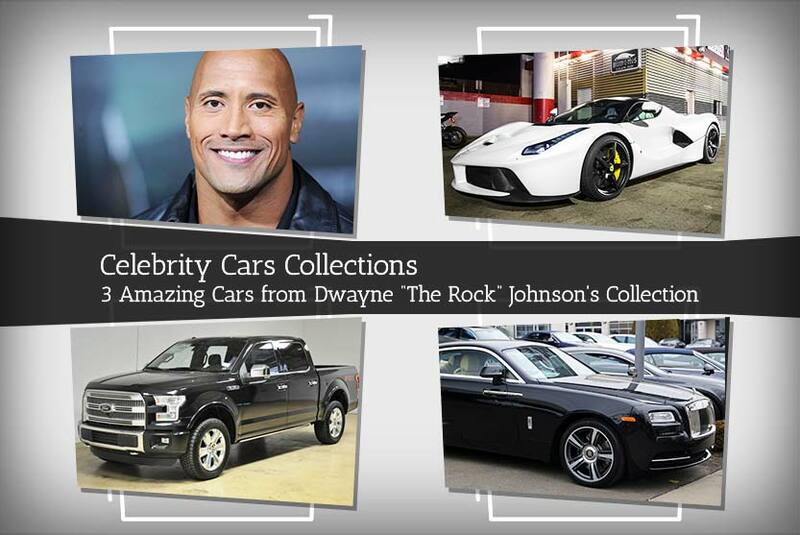 In the list of celebrity cars collections, the name of Dwayne Johnson is on the top of the list as he is the most famous wrestler. He is most commonly known as The Rock and he won many wrestling people from across the world like him and these are the few vehicles that are owned by him. These luxurious vehicles have an amazing design and powerful engine that boosts the performance of the vehicle.